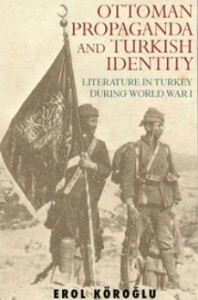 Ottoman Propaganda and the Turkish Identity | Roj Bash ! Litterature in Turkey During Word War IIn the transliteration of texts from the Arabic script to the Latin script, I mainly used the current Turkish usage, with a major exception for the Arabic letters Ë and È in the originals, which are represented by the letters â, û and î. Meanwhile, I did not change the spellings and punctuations of the passages I took from literary sources in order not to interfere with their specific textual structures. I used the forms of personal names according to the current usage, i.e. not Mehmed but Mehmet; however, I did not alter them if they were in Latin script. On the other hand, I wrote the family names of prominent historical and literary personalities in brackets throughout the text since the usage of family names was institutionalized in Turkey after the Family Names Law of 21 June 1934.For the dates of books and articles before the acceptance of Christian calendar, I first gave the date in the Rumi calendar (an adapted version of the Gregorian calendar) and then its equivalent in the Christian calendar. However, note that the publication years of books in the Rumi calendar cannot be exactly represented by Christian years. Therefore, I gave the Christian date in brackets after the Rumi date in the case of books, while I first provided the Rumi date and then the Christian one after a slash in the case of articles published in newspapers or periodicals.